In brief, my Gin Daisy is shaken with brightly coloured liqueur and served on the rocks in a tall glass with soda water added on top. Compare with my Gin Fix: built with transparent liqueur, served with crushed ice in a tall glass without soda water. 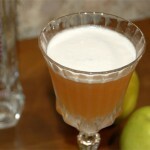 My first Gin Daisy variants were made with yellow Chartreuse and with grenadine instead of liqueur. Also I’ve gave a try to raspberry and cherry liqueurs. And later I started to try all liqueurs I have on hand that time. The best, interesting, promising and exotic variants are all collected below. 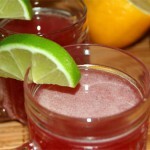 Note that I changed slightly the recipe when using syrup instead of liqueur. In that case I took 20-25 ml of fruit syrup and exclude simple syrup from the recipe. Shake all but soda water with ice and pour in ice-filled tall glass. Top with soda water. Garnish with berries, mint sprigs and a straw. Sour and sweet, very smooth long drink with hints of lemon, juniper and pomergranate. Delicious composition. A winner! Marie Brizard Raspberry was used here. Not perfect neither in taste nor in smell. However faint raspberry flavour was spotted in aftertaste. In other respects that was usual gin-and-lemon based long drink – not bad and not too good. 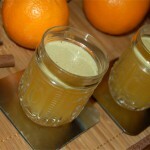 Chartreuse, a liqueur with strong distinct aroma easily formed partnership with gin and lemon juice. It dominated with sweetness and spiciness and let junior partners to make a tart and dry background for him. Awesome stuff, much more than usual long drink. French L’Heritier-Guyot Le Cherry Brandy liqueur was used here. Not of strong aroma, this liqueur was totally overpowered by gin. So it was just good fruit and juniper flavoured long drink with very faint bitter almond hint in the aftertaste. Unfortunately cheap Wenneker Sloe Gin was used as my homemade sloe gin wasn’t ready at that time. Despite unconvincing flavour of the liqueur, this Gin Daisy brought satisfactory taste where gin moderate dryness combines well with faint tart sloe note. It was driest variant among all others. Not bad and probably much better if made with proper sloe gin. This ruby red Gin Daisy was made with Italian blueberry liqueur produced by Toschi. Unlike some liqueurs mentioned above, Toschi Mirtilli is notable for rich berry taste with strong flavour of blueberry jam. Such aroma goes very well for gin botanicals, and here blueberries’ sweetness work perfectly in combination with bitter juniper and sour lemon juice. Very good long drink with rich taste and attractive appearance. I was in doubts over this version. Midori looks like ideal component here but at that time cheap DeKuyper Melon liqueur was the only option. Unnatural harsh cantaloupe taste has broke subtle harmony of gin, lemon and melon flavours. Despite this, hints of bitter almonds in the aftertaste were pleasant while melon and gin combination was such exotic so I thought I should return to this long drink if I buy a bottle of Midori liqueur. With DeKuyper Melon, it’s unworthy of your attention but give it a try with Midori. 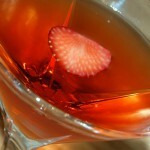 Marie Brizard Strawberry was used, and that’s another liqueur I can’t label as a product of natural taste. However strawberry chewing gum synthetic taste couldn’t harm Gin Daisy fatally. 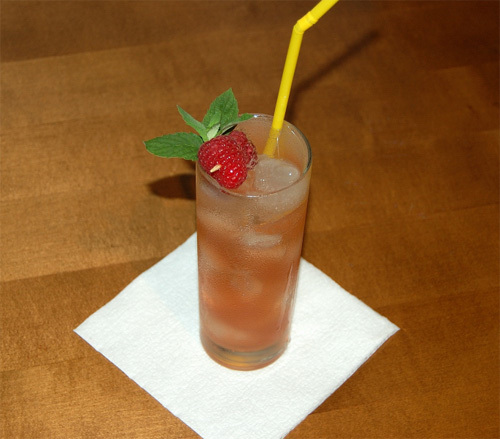 Strawberry – either as fresh berry or as jam – is a perfect partner for gin. They work amazingly in The Bloodhound, and here in Gin Daisy even in the form of average quality liqueur strawberry added delightful sweetness along with subtle bitter aftertaste from its seeds. It looks like unusual combination at first sight. But it was one of the best variants I’ve made then. Lemon, honey, ginger, gin – what a mighty combination. Actually not the ingredients itself but the combination of it all produced stunning effect of seamless complex flavour where the components supplement each other in a perfect way. One little remark: spicy gingerbread aftertaste isn’t too refreshing so the long drink is recommended to be served in a cold weather. French Maison Meneau syrup was used here. 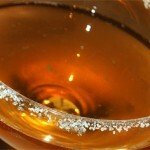 Thick tropical taste of passion fruit and cane sugar would be ideal in a cocktail with rum. Here in Gin Daisy it works well too. Bittersweet aftertaste added some exotic notes to the bitterish long drink and brought nice balance between sweet and sour/dry sides. Good choice but I have no idea how it will work with a syrup of another brands such as Monin. In the end I want to present a long drink that might be a Daisy or a Collins because of raspberry infused gin I’ve used there. 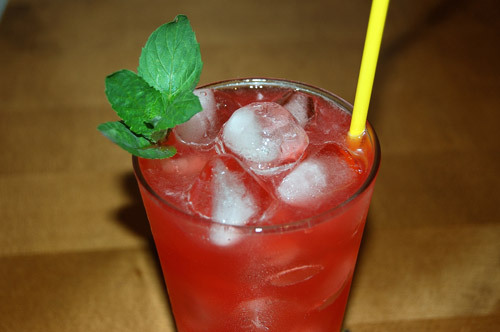 Technically, it looks like Raspberry Tom Collins but I’ve made and served it in a Daisy style. Raspberry dominates here with sweet aromatic start and a bit tart palate when light gin herbal notes begin to appear on the background. Unusually smooth juniper flavour brings delicious bitterness to the sweet berry taste. 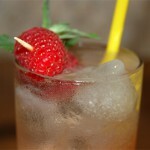 Amazing drink, much better than version with raspberry liqueur.